On the Wednesday afternoon, we participated in an intersting sightseeing activity. 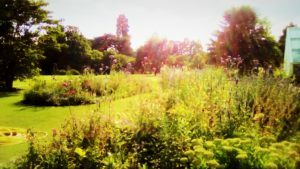 That was to walk through the Cambridge Univeristy Botanic Garden. Passing by several attractive buildings, we finally came to the gardern, which left all of us great impressions there. After entering into the pretty botanic gardern, the singing of the birds quickly drew our attention. Walking down the roads according to the map, we firstly came across a morden cafe shop. There were lots of people resting and enjoying the afternoon tea as well as the fragrance of flowers. Kept walking around, a medium-large glass room appeared in front of us. There were tons of tropical plants there including giant cactus, common nepenthes and diverse drought-enduring plants. It was a bit muggy inside of the glass house, but the view was really nice there. Among the several destinations after that, one of the most impressive sights was the giant gardern in the open air. It was crowded with all kinds of blossom in various colors and trees. A wealth of bees were busy flying here and there among the sea of the flowers. It was really a great feast for eyes. Different flowers seemed like competing with each other in either the goreous colors or elegant shapes. All of us felt so relaxed walking through this amzing heaven, hearing the clear sound of water passing by part of the roads. All in all, though pictures can’t capture the natural beauty of the garden, the fabulous gardern did leave us unforgettable memories here. Cambridge Univeristy Botanic Garden also showed that it was the power of nature that was really stirring.